Did ya’ miss me? I haven’t written in awhile, partly because I started a new job, and partly because it’s been too hot to think. Right now I have the a/c blowing on me so I was feeling inspired. A few weeks ago I made red sangria using a Bobby Flay recipe. Sangria is, in my humble opinion, the perfect summer drink but I had never made an authentic batch before. It was one of the best sangrias I’ve ever had, but it left me with some leftover pomegranate juice. Due to the aforementioned heat, I was craving something cold. 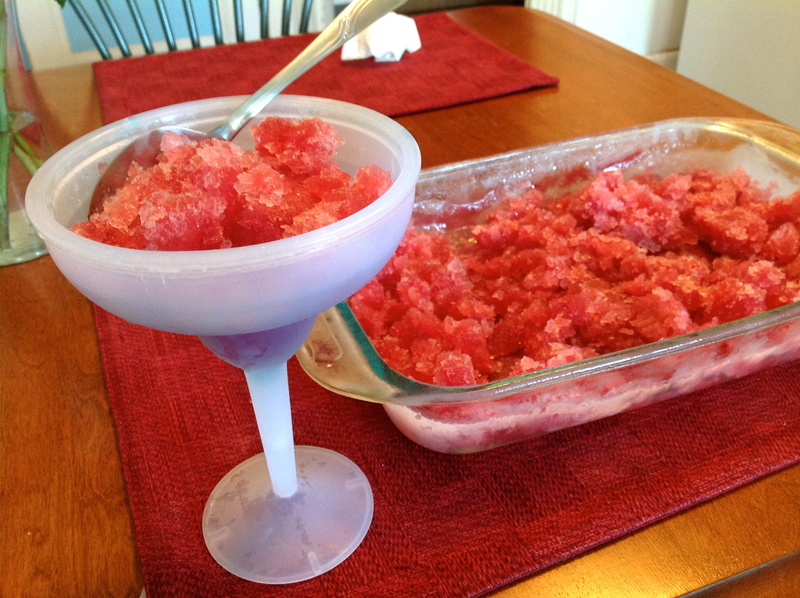 So I decided to make some pomegranate ice! Boil water and sugar until sugar is completely dissolved. Remove from heat and pour in pomegranate juice and lime juice. Give it a good stir and pour it into a baking dish. Use a large dish since you want a fairly thin layer. Put it in the freezer. In 1 1/2 hours, break it up using a fork. Make sure you break it up and mix it well. Put it back in the freezer. In 1 1/2 hours, do the same thing. Garnish with pomegranate seeds or lime rind. Experiment with your favorite juices. Pour a shot of tequila over that bad boy. This is my favorite idea.